Today I felt like sharing some vision sketches I have been posting on Twitter. Vivid crystal-clear visions are difficult to sketch; remember these are representations of light. As with all visions and symbols which present in meditation, it is important to feel the energy as it presents. Comprehension through the Heart is key; feeling and understanding the message from your Higher Self or Divine Team. Crowns and the Solar logos are predominant symbols as we ascend. This one was really gorgeous. 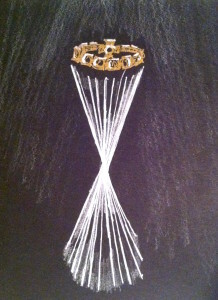 Gold ancient-looking crown, suspended in space, lit from above, with diamond-light twisting rays shining down below it. 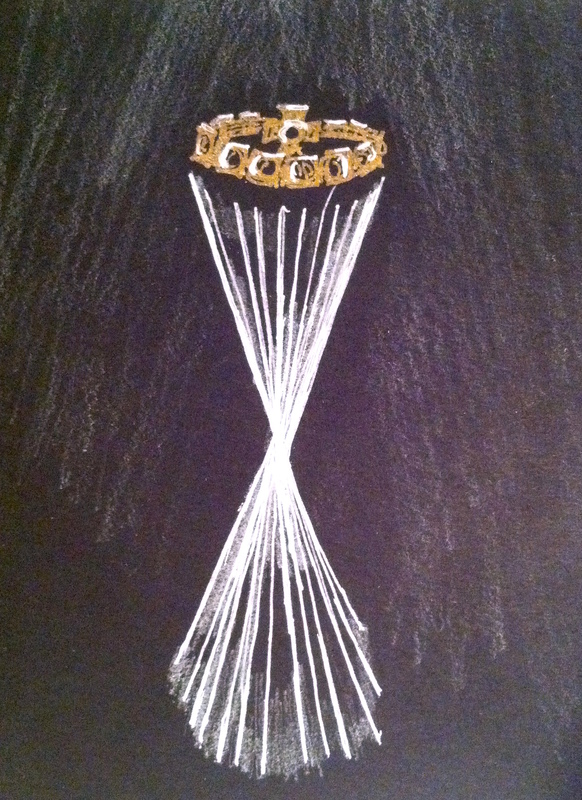 The crown remained still; the light rays glittered as they slowly spun below it. A shining, sparkling, extremely clear vision which came in just after the final Blood Moon. The crown has a Solar cross suspended in the middle of it. The sides had symbols on each piece. It had a strong Melchizedek (Malki Tzedek) energy. Prompted me to remember a version of the Bible I wrote as a child, featuring women whose names began with *M*. The Magenta Spiral ~ I know many of you must be seeing this by now. Mine began in 2011, now constant, and it grows brighter, bigger. 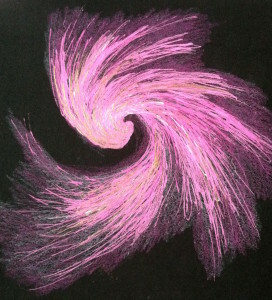 It may spin clockwise or counter-clockwise depending on energies coming/going in the Gateway. It moves slowly, elegantly, and grows wider, more complex. A grounded movement comparison: at first, the center spins like the Skype swirl when you login. A circular motion with a leading point of focus. Magenta/Fuchsia/Rose is the Gateway color to 5D, just above the classic visible spectrum. 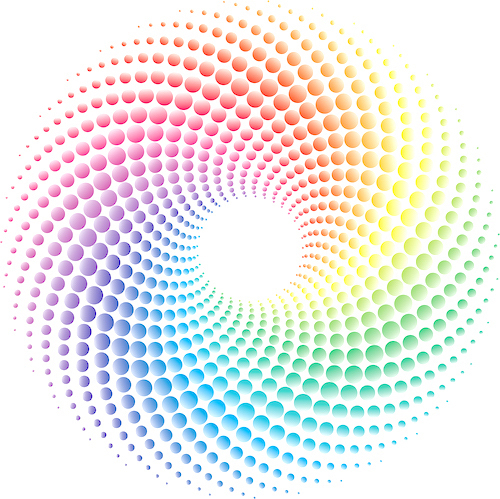 This color and vision has ties to the Rosicrucians, the Rose order, the Divine Mother and many Brotherhoods of Light. It arises when the link is made between pineal and Heart, opening the Cave of Brahma. 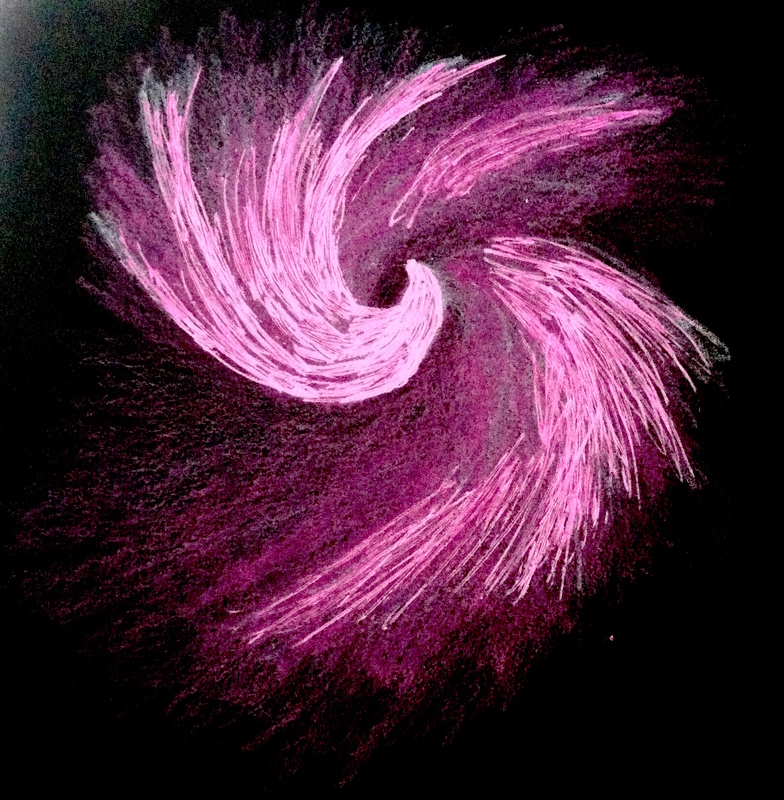 The Magenta spiral can grow intensely vivid, with gold or pure crystalline light radiating at the center. Sometimes the light gently flails around before centering and spinning; again, it is a slow, elegant, silky, fluid, graceful movement. I have used the magenta Gate vision in a few videos to stimulate activation. Stepping through it is a Gate to 5D, the Mastery realm, the Cosmic portal of the higher Pineal. Guidance: If it presents, speak to your Higher Self and let it happen; this is a pure resonance (vibrational-match) Gateway. Stay in the body and connect through the Heart; the Gate will open around you.